Steve Winters, one of the mainstays of Jurassic Roadshow, grew up in Indiana and studied geology at Indiana University – Purdue University in Fort Wayne. Thus, he and his wife, Elizabeth, go to Fort Wayne every year to see family and sometimes tour the state a bit, too. 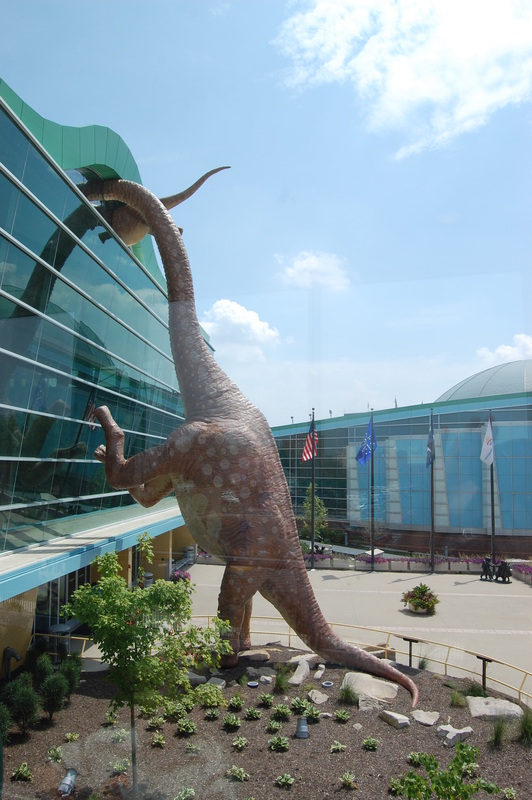 It’s hard to believe it’s been nearly 7 years since I first saw Steve’s photos of the Children’s Museum of Indianapolis, which has to be one of the best pieces of architecture out there, at least as far as dinosaurs are concerned. I’d love to have one of these peeking in my window (as long as it wasn’t alive)! Nothing else to say, really. It’s just a fantastic piece of work. Posted in UncategorizedTagged architecture, Children's Museum of Indianapolis, dinosaur models, Indiana, Purdue, Steve WintersBookmark the permalink.